Matthew Rosenberg is the one writer that would get me to pick up a comic that’s drawn by Greg Land. I’ve been a fan of his from the moment I got a review copy of We Can Never Go Home #1. His new X-Men series features characters that have either never been the epitome of the team or are at a place where they just don’t fit in with the core team. However, can a comic drawn by Greg Land still be good? I really hate it when a writer I love is paired with an artist I don’t. Usually I talk about the story first and the art second, but I want to end on a good note, so I’m tackling the art first. Also, I wanted to include the preview pages, but I like Dazzler so much, I pulled a panel or two from later in the book. Greg Land’s art is so heavily photo referenced, it begins to get distracting. It also makes for some inconsistencies. Dazzler sometimes looks so much like Land’s previous renditions of Psylocke and Sue Storm that it becomes hard to believe that he isn’t re-using reference from his files. Land’s use of reference from other sources makes for hard times. I get pulled out of the story, pondering where that reference is from. Colossus’s height is inconsistent, although consistently depicted as big. 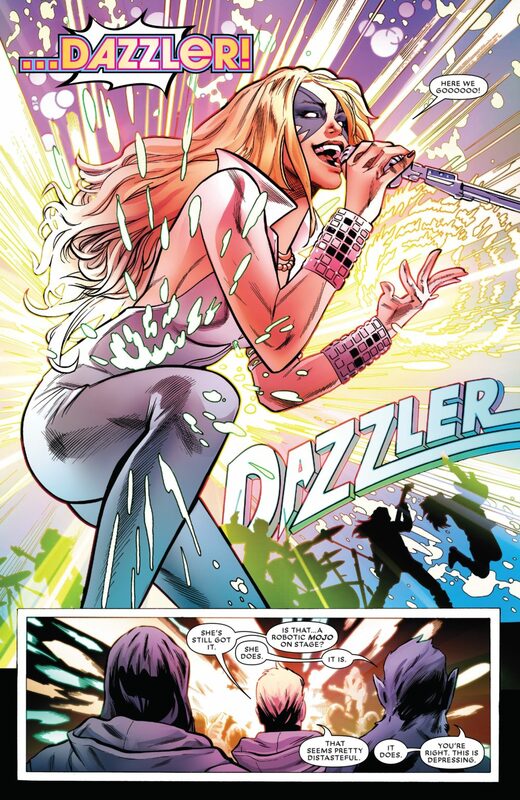 As a positive, Dazzler’s powers are depicted here in a very attractive way. Some places felt a little muddy and too many times, the characters were colored locally instead of with the effect of the environment. Frank D’Armata excelled with Dazzler, though. For that, I really appreciate him. Now, Matthew Rosenberg’s story makes it obvious that this team of X-Men is about redemption. Havok wants to prove that he’s not the same guy who did evil things. His optimism is refreshing, especially given that X-Men tend to be a little grim, especially in leadership roles. Beast is a realist, but it’s obvious he’s trying to do something right with Banshee, which is probably a sore spot with other X-Men. Colossus is trying to forget being left at the alter, and is apparently not facing it. He’s self-medicating with alcohol and it works really well with how everyone last saw him, either being left at the alter or leaving the X-Men because he doesn’t think he can be around the woman that did it. His depiction of Dazzler is someone desperately seeking the spotlight, consistent with her original depiction, and some subsequent ones. It’s the core of the character. That’s where Rosenberg’s writing really works. He’s got these characters down to their essence. These are characters out to prove themselves, even Warpath, who’s just there to keep an eye on Havok for Kitty Pryde. He’s obviously trying to prove himself to the X-Men. He’s a character that’s essentially been trying to live up to his brother’s legacy, even though that legacy was dying on his second mission with the X-Men. There’s a character study there. I’m hoping Rosenberg gets the opportunity to fully explore it. Dazzler’s a favorite, and from this issue, it looks like she might provide some levity to what could be a very grim team of X-Men. I look forward to seeing where Matthew Rosenberg takes these characters. I want another artist on this book in the worst way, because I really do not like Greg Land. These characters deserve better.